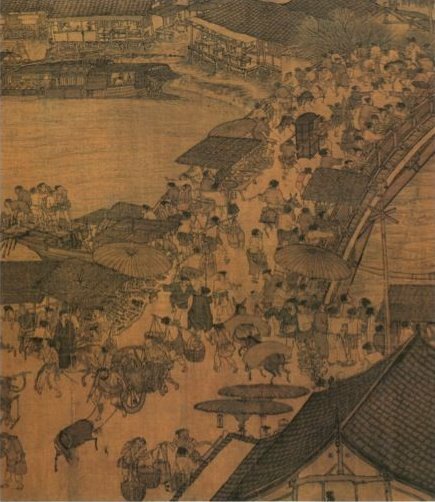 During the ninth century, literati residing in the metropolises at Chang’an and Luoyang made excursions into the countryside to restore a sense of self in the fields and the hills, away from the noise and dust of urban traffic, and they built gardens within the city to give material expression to their individual character. Literati of the eleventh century continued these practices, but they also discovered nature within crowded streets and busy avenues, where traffic flowed and ebbed like the tides of the ocean, goods and money circulated like the vital essences of the body, and trades flourished and withered with the seasons. Whereas literati of the ninth century had expressed their individual proclivities through their relationship with natural landscapes and natural objects, literati of the eleventh century developed a new, more precise sense of human subjectivity by their engagement with the city. The anonymous crowds, the natural patterns of traffic and trade, and the humanlike but unconscious machinery of locks and watermills caused poets, painters, and philosophers to objectify the self and to re-appropriate the subject through their engagement with commodities and the material world. Christian de Pee is an Associate Professor of History at the University of Michigan, specialized in the history of the Middle Period of Chinese history (800-1400 CE). His general interest in the relationship between text, time, space, and self-representation has taken concrete form in a book about wedding ritual (The Writing of Weddings in Middle-Period China: Text and Ritual Practice in the Eighth through Fourteenth Centuries, 2007) and in articles about ritual manuals, archaeology, writing and gender, historiography, and cities. He is currently completing an intellectual history of the city in eleventh-century China, entitled Losing the Way in the City: Urban Space, Subjectivity, and Intellectual Crisis in Middle-Period China, 800-1100.